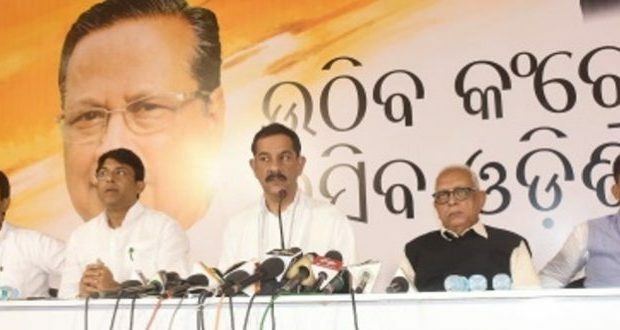 Bhubaneswar:228/108/18: Odisha Congress in-charge Jitendra Singh on Monday said the state government’s craziness for ‘Zero Casualty’ publicity has led to the death of over 70 people in the cyclonic storm Titli and subsequent floods. He alleged that Naveen Patnaik’s administration is solely responsible for the death more than 70 innocent people. Singh said had the state administration took the IMD warning seriously and localised the cautionary operation well before the landfall, then the lives of all the deceased could have been saved. “From the beginning Odisha Government’s officers and office of the Special Relief Commissioner (SRC) were not serious. Focus of the entire administration was laid centred in Ganjam district which happens to be Chief Minister Naveen Patnaik’s constituency district. This serious allegation is being clearly established in the press releases by SRC on the very day Titli made landfall,” he said. The PCC Pravari said the press releases of SRC on the day before and the day following Titli landfall have detailed description of people affected and people evacuated of Ganjam district. Surprisingly, the report does not have detailed information about the worst affected Gajapati district, he added. The IMD warning clearly specified that after landfall near Palasa, Titli would likely to re-curve northeastwards move across Odisha. And there would heavy to very very heavy rainfall in Ganjam, Gajapati, Raygada, Puri, Phulbani districts. This clearly proves the government justification of not expecting the heavy rainfall as blatant lies, Singh said. He said before the landfall no one from district administration went to the worst affected Baraghar village in Gajapati district where 18 people died due to the landslide, and tried to evacuate the people to safer place. Singh said the state government was so much obsessed with Zero Casualty propaganda that it did not make the casualty toll public for almost 4 days, which is unlikely of government action. “Media reports and first-person accounts of victims lay bared the poor preparedness of government agencies in handling relief and reconstruction work immediately after the incident. Rescue workers reached the worst affected Barghar village in Gajapati district two days after the incident,” said Singh.